You already know the value of Sage Payroll. What if you could integrate all your most time-consuming HR functions into a single system? Sage HRMS makes it possible! 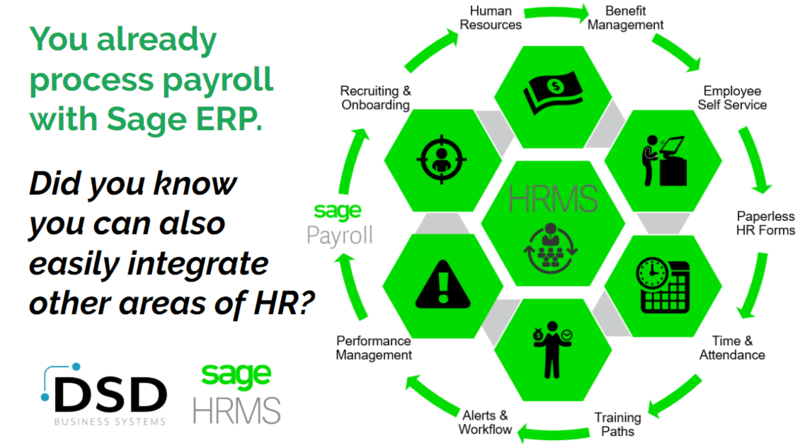 Sage HRMS allows you to create an HR suite for your unique needs. The choice is yours! Integration with your Sage system allows you to optimize the entire HR experience, eliminating the need for manual record-keeping and redundant data entry. Sage HRMS Time & Attendance module saves most companies 3-5% in payroll expenses by efficiently providing job allocation, scheduling, and time-off tracking. Easily collect, automate, and analyze employees’ attendance data related to hours worked & overtime while auditing functions guarantee accuracy and compliance for all payroll information. 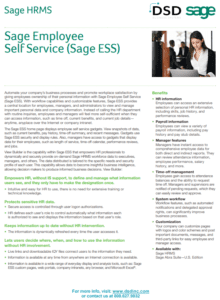 Sage Employee Self Service module empowers employees with ownership of their personal information. Automated workflow enables employees and supervisors to manage time-off requests, benefits changes, job details, and training history – anywhere, anytime. Sage HRMS Cyber Recruiter module centralizes information about active and nonactive employees, eliminates ambiguity and gives you unmatched views of your workforce while enabling secure data-sharing with internal managers for better-informed decision making. Want to know more? Join our live session! We’re hosting a live event! This hour long session will begin with an overview of the Sage HRMS modules and how they seamlessly integrate with your Sage system. Then our HRMS experts will review FAQs and answer your questions relating to function, price, implementation, and more! Can’t wait for the session? Contact us today! Its time to leave disparate systems in 2018.